On the General > Editors > File Associations preference page, you can add or remove file types recognized by the Workbench. You can also associate editors with file types in the file types list. Add...: Adds a new file or file type (extension) to the predefined list. In the resulting New File Type dialog, type the name of a file or a file extension. If you are adding a file extension, you must type either a dot or a "*." before the file type (e.g., ".xml" or "*.xml" as opposed to simply "xml"). Add...: Adds a new editor to the list of editors associated with the file type selected above. In the resulting Editor Selection dialog, you can choose an editor to launch either inside the Workbench (internal) or outside the Workbench (external); click Browse to locate an editor yourself if the editor you want is not displayed in the list. 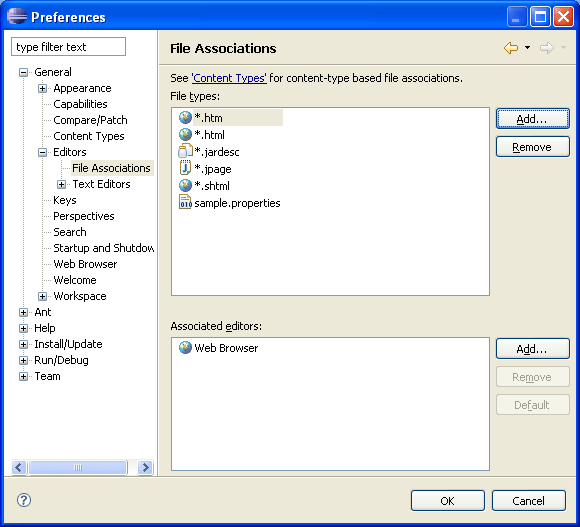 Remove: Removes the association between an editor and the file type selected above. Note: Any editor that is bound by content type may not be removed from this list. Currently, there is no mechanism available to remove these editors. Default: Sets the selected editor as the default editor for the file type selected above. The editor moves to the top of the Associated Editors list to indicate that it is the default editor for that file type.